"The Boy and the Beast," a new Japanese animated fantasy written and directed by mega-talented Japanese filmmaker Mamoru Hosoda ("Summer Wars"), will probably enter and exit American theaters in a flash. American distributors Funimation are not marketing the film to anyone but established anime fans. After all, Japanese and Asian movies in general are treated like niche products designed for native language speakers and genre-fetishists only. "The Boy and the Beast" won't dent that seemingly unbreakable mold mentality since its plot will probably seem familiar to anyone who enjoys other recent anime, particularly Hayao Miyazaki's "Spirited Away," not to mention classic live-action fantasies like "The Wizard of Oz." But what sets this film apart from its generic predecessors is writer/director Hosoda's knack for playful set pieces, and unsentimental love of surrogate familial communities. This isn't just a sloppy wet kiss of an animated movie, though the film does veer towards that conclusion. 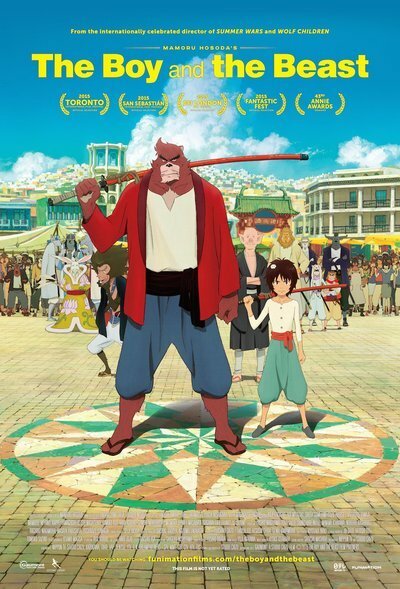 Instead, "The Boy and the Beast" is a visually impressive mix of hand-drawn and CGI animation with basic action-adventure elements that are always viscerally satisfying thanks to Hosoda's apparent warts-and-all love for humanity. Hosoda's action-adventure is, as its title implies, a story about a boy. That's important since the film's perspective—namely its mistrust of authority figures, quasi-bro-y camraderie, and yes, juvenile clumsiness around women—is informed by the gender of hot-head hero Ren (Aoi Miyazaki, no relation to Hayao). Ren is nine years old when his distant relatives try to take him into their custody. His mother has died in a sudden accident, and his father has not been contacted (he and Ren's mother divorced). Ren is so angry that he runs away, and is almost immediately abducted by Kumatetsu (Koji Yakusho), a humanoid bear-monster who lives in Jutengai, a fantastic world ruled by anthropomorphized animals. Kumatetsu, the undisciplined heir to Jutengai's throne, needs an apprentice in order to prove himself to Jutengai's enigmatic current ruler (a bunny-man with white, navel-long whiskers). So Ren is made to help Kumatetsu defeat his holier-than-thou rival Iozan (Kazuhiro Yamaji). One of the more eccentric aspects of this story is that it doesn't simplistically conflate Ren and Kumatetsu's respective needs. Helping Kumatetsu out doesn't automatically confer life-changing/character-building wisdom to Ren. Instead, it gives him the courage to infrequently check out of Kumatetsu's story, and forge his own path. "The Boy and the Beast" is, in that sense, a bifurcated narrative with two overlapping plot threads. The first thread is about Kumatetsu, and what Ren tries to "assimilate" from him. The other thread begins when Ren learns he can return to his world: he develops a romance with bookworm Kaede (Suzu Hirose) while trying to bond with his estranged father. In Ren's first story, Kumatetsu is treated like a surrogate father, someone whose story plays a vital part in Ren's growth. But in Ren's second story, Kumatetetsu is not just an imaginary foil for Ren. Many American—and even some lesser Miyazaki-produced/directed—animated movies baby their viewers by suggesting that their lead protagonists' fantasy lives are more important than the "real world" problems that they're actively retreating from. "The Boy and the Beast" is the rare exception to that rule. When Ren returns to the "real world," Kumatetsu stops being important. Allowing Ren to leave Jutengai when he gets older makes the second half of his story feel disjointed. Kumatetsu becomes an after-thought since Ren has to figure out a way to master the adolescent anger he's defined himself with since his mother's death. Still, both halves of Ren's narrative teach him how to be a better person by forcing him to rely on non-biological family members. That's a staple of children's films: our loved ones are frequently not related to us by blood. But Kumatetsu's bond with Ren is, even within that context, special. Kumatetsu, a muscular, ursine dead-ringer for Chris Hemsworth, is an adolescent projection of wayward masculinity. He's what you would get if you asked an emotionally-stunted pre-pubescent boy what they'll be like when they grow up: lazy, angry, and way too proud for his own good. So when Ren and Kumatetsu learn to accept each other's support, it is and it isn't the stuff that lesser buddy comedies are made of. These guys care about each other, but Ren supports his mentor by yelling stuff like, "Stop sulking and get up!" Not exactly tough love, but tougher than most. None of these finer feelings would matter if "The Boy and the Beast" weren't immediately engaging. Hosoda's knack for choreographing big action set pieces and quiet dialogue moments really makes his latest feature an emotionally rewarding crowd-pleaser. Almost all animated filmmakers appeal to their pint-sized audience's emotions, but few are able to keep adult viewers equally engaged. "The Boy and the Beast" may not be playing at a theater near you, but it should be.